Located on the island of Ilha Upaon-Acu, state capital Sao Luis represents the largest city in Maranhao. Start off your visit on the 18th (Sat): contemplate the long history of Palacio dos Leoes, then take in the architecture and atmosphere at Se Church, and then stroll through Caura Beach. To find other places to visit, ratings, and tourist information, you can read our Sao Luis trip planning tool . Vienna, Austria to Sao Luis is an approximately 22-hour flight. The time zone changes from Central European Time (CET) to Brasilia Time (BRT), which is usually a -4 hour difference. Expect a bit warmer weather when traveling from Vienna in May: highs in Sao Luis hover around 36°C, while lows dip to 28°C. Wrap up your sightseeing on the 18th (Sat) to allow time to travel to Lencois Maranhenses National Park. On the 19th (Sun), explore the activities along Lagoa do Murici and then stroll through Capivara Beach. For more things to do, photos, and tourist information, you can read our Lencois Maranhenses National Park travel itinerary planner . Explore your travel options from Sao Luis to Lencois Maranhenses National Park with the Route module. In May, daytime highs in Lencois Maranhenses National Park are 36°C, while nighttime lows are 28°C. Finish your sightseeing early on the 19th (Sun) so you can travel to Parnaiba. With over 170,000 inhabitants, Parnaiba stands as the second most populous city in the state of Piauí, and one of its four coastal municipalities. Kick off your visit on the 20th (Mon): tour the pleasant surroundings at Macapa Beach and then kick back and relax at Itaqui Beach. On the 21st (Tue), you'll have a packed day of sightseeing: kick back and relax at Ponta das Canarias Beach, then enjoy the sand and surf at Coqueiro Beach, and then pause for some serene contemplation at Nossa Senhora das Gracas Church. For ratings, other places to visit, reviews, and other tourist information, use the Parnaiba trip planner . Explore your travel options from Lencois Maranhenses National Park to Parnaiba with the Route module. May in Parnaiba sees daily highs of 39°C and lows of 30°C at night. 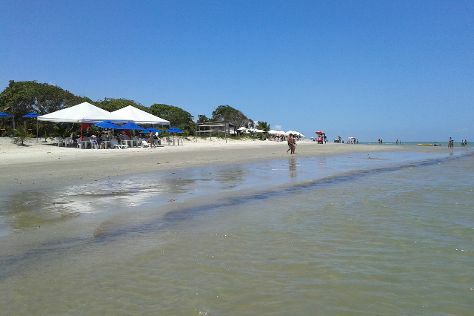 Cap off your sightseeing on the 21st (Tue) early enough to go by car to Jericoacoara. On the 22nd (Wed), stroll through Mangue Seco Beach and then have fun at Fly Wind Kite School. On the next day, enjoy the sand and surf at Jericoacoara Beach, enjoy the sand and surf at Malhada Beach, and then pause for some serene contemplation at Igreja Nossa Senhora do Rosario de Fatima. 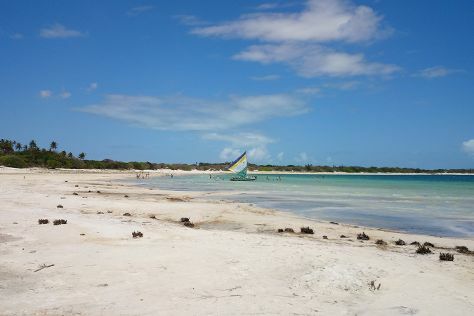 Quickly create a custom-made itinerary for Jericoacoara using our trip planner. Drive from Parnaiba to Jericoacoara in 4 hours. Alternatively, you can do a combination of bus and taxi. The time zone changes from Brasilia Time (BRT) to Amazon Time (AMT), which is usually a -1 hour difference. Wrap up your sightseeing on the 23rd (Thu) to allow time to travel to Porto Seguro. Start off your visit on the 24th (Fri): identify plant and animal life at Reserva Pataxo da Jaqueira, kick back and relax at Coroa Vermelha Beach, and then go for a walk through Sitio Arqueologico das Ruinas da Igreja do Outeiro Da Gloria. Keep things going the next day: enjoy the sand and surf at Muta Beach and then enjoy the sand and surf at Pitinga Beach. For traveler tips, reviews, maps, and more tourist information, you can read our Porto Seguro vacation maker site . You can fly from Jericoacoara to Porto Seguro in 7.5 hours. Alternatively, you can do a combination of shuttle, bus, and flight; or drive. Traveling from Jericoacoara to Porto Seguro, you'll lose 1 hour due to the time zone difference. In May, plan for daily highs up to 31°C, and evening lows to 24°C. Finish your sightseeing early on the 25th (Sat) to allow enough time to travel to Armacao dos Buzios. Perched on the tip of a peninsula about 175 km (109 mi) east of Rio de Janeiro, the coastal town of Armacao dos Buzios attracts visitors looking to enjoy a beachside getaway without the crowds and chaos of the big city. Kick off your visit on the 26th (Sun): relax and rejuvenate at some of the top local wellness centers and then enjoy the sand and surf at Praia do Forte. Get ready for a full day of sightseeing on the 27th (Mon): kick back and relax at Ferradura Beach, kick back and relax at Tartaruga Beach, and then don't miss a visit to Rua das Pedras. You can plan Armacao dos Buzios trip in no time by asking Inspirock to help create your itinerary. Do a combination of flight, taxi, and bus from Porto Seguro to Armacao dos Buzios in 5.5 hours. Alternatively, you can do a combination of flight and bus; or drive. In May, daily temperatures in Armacao dos Buzios can reach 30°C, while at night they dip to 21°C. 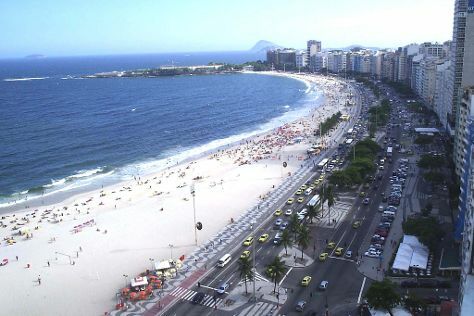 Finish up your sightseeing early on the 27th (Mon) so you can go by car to Rio de Janeiro. Start off your visit on the 28th (Tue): stroll through Copacabana Beach, then kick back and relax at Pedra do Arpoador, then enjoy the sand and surf at Praia de Ipanema, and finally appreciate the history behind Corcovado Christ the Redeemer. On the 29th (Wed), you'll have a packed day of sightseeing: get lost in a book at Real Gabinete Portugues Da Leitura, get great views at Leblon Beach, then enjoy the sand and surf at Barra da Tijuca Beach, and finally admire the natural beauty at Jardim Botânico do Rio de Janeiro. To find ratings, maps, traveler tips, and more tourist information, you can read our Rio de Janeiro holiday builder . You can drive from Armacao dos Buzios to Rio de Janeiro in 2.5 hours. Alternatively, you can take a shuttle; or take a bus. In May in Rio de Janeiro, expect temperatures between 31°C during the day and 24°C at night. Cap off your sightseeing on the 29th (Wed) early enough to travel to Bonito. Start off your visit on the 30th (Thu): look for all kinds of wild species at Parque Ecologico Rio Formoso, identify plant and animal life at Gruta Sao Mateus, and then stop by Armazem do Joao. 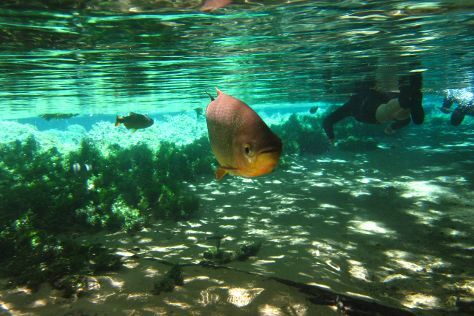 Keep things going the next day: admire nature's wide array of creatures at Aquario Natural and then admire nature's wide array of creatures at Rio da Prata. For other places to visit, reviews, photos, and tourist information, go to the Bonito trip builder site . Getting from Rio de Janeiro to Bonito by flight takes about 4.5 hours. Other options: drive; or take a bus. The time zone difference when traveling from Rio de Janeiro to Bonito is minus 1 hour. Finish your sightseeing early on the 31st (Fri) to allow enough time to travel to Cuiaba. On the 1st (Sat), head outdoors with Outdoor Activities, then take in the architecture and atmosphere at Chuurch of Nossa Senhora da Guia, and then explore the world behind art at Serviço Social do Comércio-SESC-Arsenal. To find maps, traveler tips, photos, and more tourist information, you can read our Cuiaba road trip planner. Getting from Bonito to Cuiaba by combination of shuttle and flight takes about 7 hours. Other options: take a bus; or drive. June in Cuiaba sees daily highs of 36°C and lows of 22°C at night. Wrap up your sightseeing on the 1st (Sat) early enough to travel to Iguazu National Park. Kick off your visit on the 2nd (Sun): take in the dramatic scenery at Cataratas del Iguazu. For maps, photos, ratings, and tourist information, refer to the Iguazu National Park holiday app . Traveling by combination of flight and car from Cuiaba to Iguazu National Park takes 7 hours. Alternatively, you can do a combination of bus and car; or drive. You'll lose 1 hour traveling from Cuiaba to Iguazu National Park due to the time zone difference. Prepare for little chillier weather when traveling from Cuiaba in June: high temperatures in Iguazu National Park hover around 25°C and lows are around 13°C. Wrap up your sightseeing on the 2nd (Sun) to allow time to drive to Foz do Iguacu. On the 3rd (Mon), see human ingenuity at work at Iguazu Falls. For photos, ratings, and more tourist information, read our Foz do Iguacu vacation planner. Foz do Iguacu is very close to Iguazu National Park. June in Foz do Iguacu sees daily highs of 25°C and lows of 14°C at night. Wrap up your sightseeing on the 3rd (Mon) to allow time to travel to Florianopolis. Eschew the tourist crowds and head to Matadeiro Beach and Bombas Beach. You'll enjoy a bit of beach vacationing at Lagoinha do Leste and Barra da Lagoa Beach. Change things up with a short trip to Bombinhas Beach in Bombinhas (about 1h 30 min away). The adventure continues: stroll through Praia Mole and pause for some serene contemplation at Paroquia Santo Antonio. 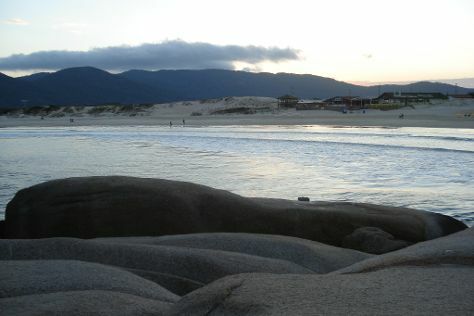 To see maps, reviews, and other tourist information, go to the Florianopolis trip maker site . Traveling by flight from Foz do Iguacu to Florianopolis takes 4 hours. Alternatively, you can do a combination of flight and shuttle; or drive. In June, plan for daily highs up to 24°C, and evening lows to 16°C. Finish your sightseeing early on the 6th (Thu) to allow enough time to travel to Sao Paulo. Kick off your visit on the 7th (Fri): admire the masterpieces at Pinacoteca do Estado de Sao Paulo, take a stroll through Jardins District, and then stroll through Ibirapuera Park. Get ready for a full day of sightseeing on the next day: take a stroll through Paulista Avenue, then browse the fresh offerings at Mercadao - Sao Paulo Municipal Market, and then examine the collection at Catavento Cultural e Educacional. To find traveler tips, reviews, ratings, and other tourist information, refer to the Sao Paulo trip builder site . Traveling by flight from Florianopolis to Sao Paulo takes 3.5 hours. Alternatively, you can do a combination of bus, taxi, and flight; or drive. In June, daytime highs in Sao Paulo are 26°C, while nighttime lows are 15°C. Wrap up your sightseeing on the 8th (Sat) early enough to travel back home.